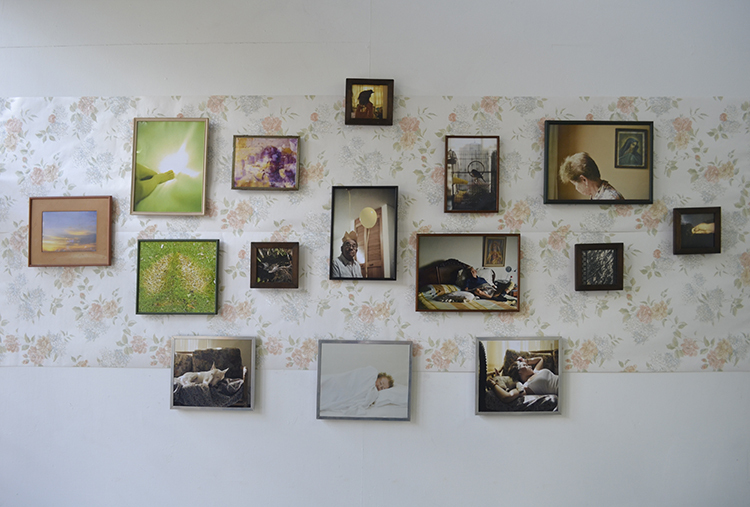 Microgrant recipient and mentor program participant Natalia Lopera's installation for her final university review of 2012. Last week fototazo celebrated its second anniversary, creating an opportunity to take a look at the past year and to talk about plans for the site for 2013. This is also the "yearly report" required for becoming a non-profit organization (see below)! The site's mission is to develop an integrated system of support for young, emerging Colombian photographers with the goal of eventually extending the program to other countries. The program currently consists of four parts: microgrants for equipment purchases, the equipment delivery program to give photographers access to United States market prices, the mentorship program to give the photographers guidance, feedback on their work, and connections to an international team of mentors drawn from across the spectrum of the photography world, and, finally, private classes in Medellín that I am giving to some of the students involved with the microgrant and mentorship programs. My goal is to strengthen and grow all four parts of the integrated support program in 2013. In 2012 the microgrant program raised $1,385 and purchased three cameras and a lens. A fifth grant for a lens purchase is in the process of funding. I would like to send a special thank you to those who have believed in the value of these grants and contributed towards their successful completions. The equipment delivery program saved photographers approximately $550 through access to US market prices and additionally delivered several pieces of equipment unavailable in Colombia that are therefore unable to be counted in this dollar total. Both numbers, however, are down from 2011 despite a doubling of site visits during the year, proving the need to seek more steady streams of revenue for the microgrant program. I am subsequently exploring ways to create income beyond a reliance on individual donations. Possible ideas include print sales, sidebar banners for financial partners of the site, post sponsorships, grant applications to a range of foundations, and the pursuit of corporate sponsors. A major goal for the site in 2013 is its recognition as a 501(c)(3) non-profit organization which will allow me to approach potential corporate donors more easily by providing tax relief benefits for contributions. As a 501(c)(3) organization I also will approach equipment manufacturers for wholesale prices for grant equipment. This was also a goal for 2012, but time (as well as the $400 application fee) has been hard to come by to move ahead with this process. Prices for photography equipment have fallen in Colombia, but the continued use of fototazo's equipment delivery service proves its value and it's a program I will continue in 2013. If anyone will be visiting Colombia, please let me know and perhaps we can arrange for a delivery. The mentorship program has been difficult to establish and needs reexamining. There are a number of issues that I've tried to identify in order to resurrect the program. The majority of the photographer participants are taking seven classes (as is normal in the universities here) or are recent graduates working long hours. Either situation makes time to create extra photographic work and participation in the mentorship program difficult. For a number of those involved, this is their first international interaction - personally or as an artist - which has lead to some timidity. Another issue is level of experience. The photographers taking part are early career, young photographers who are perhaps not as consistent in their work and projects as a mid- or later-career artist might be. The major difficulty from my perspective, however, has been language. I had hoped that communications would be easier than they have been, but the photographers involved with the program have told me they feel self-conscious about their ability to communicate in English and have had difficulty understanding feedback. Personal connections have been difficult to establish between photographers and mentors. All that being said, I believe in the basic idea of the program and will work to navigate the issues encountered so far during the coming months. As for site content, I would also like to extend a thank you to all of the 2012 contributors of images and words for their help in providing a level of content that has helped the site to expand and grow its readership steadily throughout the year. The site received visits from 164 countries in the second calendar year and page views increased over 100% from the previous year thanks to the quality of their efforts. The site has established a number of continuing series - including Interviews, The Image, Profile, Gallery, Project Releases, Reading Shortlists, A Question About, Exchange Edits, and Photographers on Photographers - as well as limited run series, such as the Publisher Q&A2 Series and How to Start a Project. In 2013 I expect to evolve both continuing and short run series as well as to run more of the types of collaborative cross-site dialogues and projects begun in 2012, such as the book discussion group created with Flak Photo and the Latin America photography issue published with F-Stop Magazine. I plan to publish longer, more in-depth articles in 2013, but - in exchange - will be making fewer posts. This should help me balance running this site with being a photographer and educator as well as provide the site with deeper original material. I also plan to feature more work from Latin America and use the site to serve as a bridge between Latin American photographers and an international audience. Another goal in terms of content for 2013 is to begin a shift to more of an editor role by expanding the role of contributors in content creation and, perhaps, delegating certain series or parts of the site to others to edit. This began in 2012 with posts such as an interview of Martin Hyers and William Mebane by the photographer Kevin Thrasher, but is something I hope to push much further in the coming year. This will allow me to focus on writing pieces of opinion and history, something I began adding to the site last year and that has helped advance content and engage fototazo with a broader online community and dialogue. fototazo also started a site for discussing photography online in Spanish on Facebook last year called la red fototazo which is a side project that I hope will continue to advance in terms of quality of discussion and amount of participation. It's attracted over 500 members in 7 months. Thank you to Mariela Sancari, Arturo Soto, and Jaime Permuth for their help in getting this project off the ground. I would also like to extend a thank you to the fototazo Board of Directors - photographers Nicholas Nixon, Laura McPhee, and Gabriel Mario Vélez and business leaders Yaron Ben-Zvi and Raphael Crawford - for another year of service in this role. I will be exploring the possibility of dividing the Board into an active Advisory Board and a Board of Trustees during 2013.